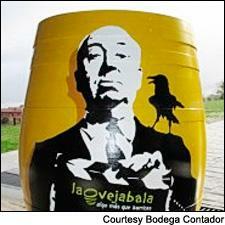 Alfred Hitchcock stars in Bodega Contador's series of Hollywood-themed artist barrels. • We know what Brad Pitt and Angelina Jolie do to increase the value of their wine barrels—they just sign them. But what do non-Hollywood winery owners do to increase interest in their barrels? Rioja's Benjamín Romeo sees no reason he can't capitalize on Hollywood too. In an excellent example of “repurposing” to assign some value to retired barrels, Romeo, owner of Bodega Contador in Rioja, teamed up with his artist friends Raul San Cristobal and Enrique Martin of the creative firm La Oveja Bala to turn old barrels into art for the Laovejabala project. Romeo, a self-described movie-buff, makes a Tempranillo and Garnacha blend called Predicador (Preacher) with the iconic hat Clint Eastwood wore in the movie Pale Rider featured prominently on the label, so he isn’t afraid to show his love for a great character. Bodega Contador puts on an annual art exhibit, and this year the homage-to-film theme went from the label to the barrels. Each barrel is hand-painted, which isn’t as easy as it sounds given the curved surfaces the artists have to consider when making the scenes still appear optically correct. You’ll see Robert DeNiro in Taxi Driver, Eastwood again, this time from Dirty Harry, Jack Nicholson from the memorable axe-through-the-door scene in The Shining, and many other immediately recognizable faces. The artists have set the price for the Hollywood barrels at about $1,600 each. Click on the thumbnails below to get a closer look. • In ancient Israel, even the good wine was jug wine, so how to tell the plonk from the premium? Prof. Gershon Galil of the University of Haifa thinks he's found a way, providing a new interpretation for an eight-letter inscription on a clay jug fragment that has flummoxed scholars since it was discovered in the Temple Mount area of Jerusalem six months ago. Dated to the 10th century B.C.—King Solomon's time—the 3,000-year-old inscription is the oldest ever found in a Jerusalem dig, and if Galil's interpretation is correct, it is important proof that by Solomon's time, Jerusalem had become a city with complex administrative organization, literacy and—the innovation that proves you've truly "arrived" as a civilization—a wine-rating scale. As reported in Haaretz, according to Galil, the inscription should read "in the year […]M, wine, part, m[…]" which on its own makes about as much sense as the original series of squiggles, but basically it works like other wine labels: the first part is the vintage (the year of Solomon's reign), the last part is the appellation (where the jug came from) and the middle part is the quality level. "Wine part" is the lowest of three classifications: "good," "no good" and "partial." Unfiltered also examined the inscription and noted two giraffes and three snakes, which would make this our oldest-known example of a critter label. Galil's theory: "This wine wasn't served to Solomon's emissaries, or in the temple, but apparently was for the slave construction workers who worked in the area." A tough gig, but at least you could unwind at the end of the day with a nice jug of wine part. • This past week, Unfiltered predicted that Kanye West would start selling bottled water marketed as wine, but back in the real world, Napa's Montesquieu Winery (a wine broker) has quietly been turning wine into water—for thousands of needy Ethiopians. In partnership with winemaker Michel Rolland, South Africa's Remhoogte winery and Wine to Water founder Doc Hendley, Montesquieu is donating $20 to Wine to Water with the sale of every bottle of Remhoogte Bonne Nouvelle Stellenbosch 2003 (87 points, $39) through its website. Montequieu previously raised $122,000 for Wine to Water through the sale of 300 magnums of 2008 Wine to Water Meritage made by Bob Levy and Martha McClellan. According to Wine to Water, dirty water kills more children than HIV/AIDS, malaria and tuberculosis combined, and more than 1 billion people worldwide live without access to potable water. To date, Montesquieu and its winemaking partners have raised more than $150,000 for Wine to Water, funding 10 water wells in Ethiopia.